Woolly aphids are soft-bodied, sap-feeding insects that produce fine, waxy strands and lots of sticky honeydew. Life cycles can be complex. 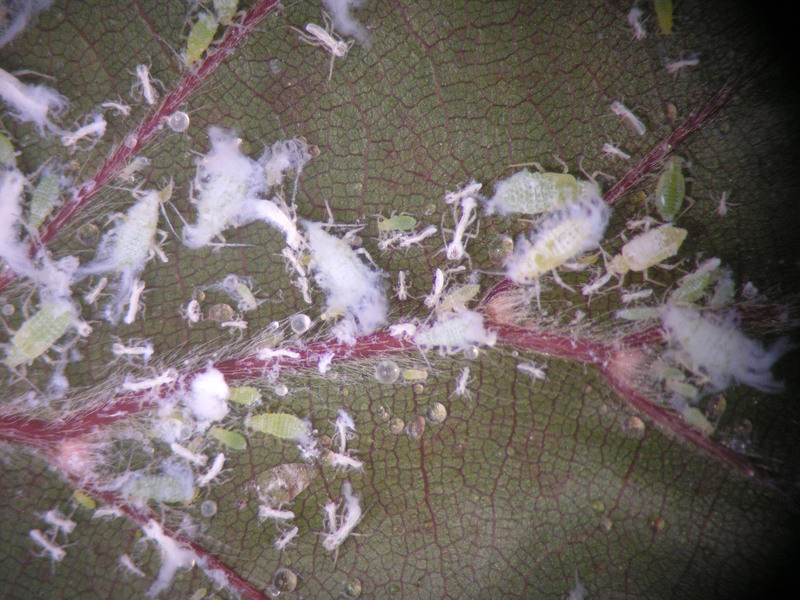 Depending on the species, winged aphids may move to a secondary host or to another site on the same host. Ash leaf curl aphid feeds on and distorts ash foliage in spring, and then moves to ash roots. Woolly alder aphid appears as white masses on leaves and twigs of silver maple in spring and alder twigs and branches in summer. Silver maple leaves may fold over if many aphids are present. Woolly apple aphids form colonies at wound sites on trunks, limbs, twigs, and water sprouts of apple and crabapple. As numbers increase, some aphids move below ground to feed on roots, where infestations can seriously damage young trees. Wooly elm aphid colonies occur on American elm in spring and move to serviceberry to feed on roots. Large numbers of aphids on serviceberry roots can damage new shrubs in the landscape. Woolly aphid infestations rarely kill established, healthy trees but leaf distortion and excessive honeydew productions are causes for control. If aphids are limited to a few leaves or shoots, then physical removal is a good option. Also, pruning a dense inner canopy makes a tree less suitable for aphids. A strong jet of water can wash many aphids off plants where they will soon perish. Insecticidal soap provides good control but thorough coverage is needed and repeated applications may be needed.